MWL notes: Martinez the next Pedro? Quad Cities catcher Robert Stock fires out his description of pitcher Carlos Martinez as quickly as Martinez can fire a strike across the plate, and the description is just as lively as a Martinez fastball. "He's electric," Stock said. "He's not the biggest of guys. He's skinny and young. His motion sure doesn't look 100 percent to me, but then the ball comes out and it's in the upper 90s. It's certainly everything that electric would entail." 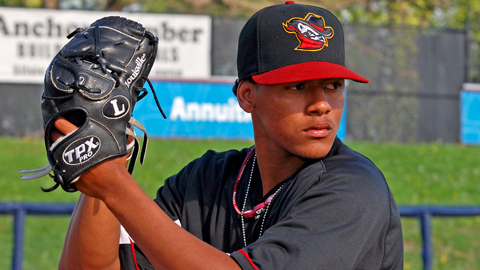 Martinez is a 6-foot, 165-pound right-hander with a fastball that averages 97 mph and frequently touches 100. The native of Colinas Del Sur, Dominican Republic, dreamed of reaching the Major Leagues as a shortstop, but a $1.5 million signing bonus from the Cardinals changed his path. "I miss playing shortstop," Martinez said through a translator. "The first time the Cardinals talked to me about being a pitcher, I said I don't want to pitch. I want to be a shortstop. But if being a pitcher is the best way I can make it to the Majors, then I'll work hard at being a pitcher." Although Martinez can't contain a shy smile at the thought of at least being able to hit as a pitcher in the National League, pitching has been his total focus since he took the mound about a year ago. "The first time I went to the mound, I felt like a freshman, because it was the first time I was going to pitch. But after that spring, I felt more comfortable," recalled Martinez, who went 3-2 with a 0.76 ERA and 78 strikeouts in 12 starts in the Dominican Summer League last year. "I really have to focus on being a pitcher. I have to forget about being a shortstop and being a hitter. I have to learn a lot, mostly about throwing an out pitch." Stock said Martinez is making the transition effectively. "He's learning," Stock said. "It's tough. When you throw it so hard ... I know he wants to develop his curveball and his change-up, but at times, if you're throwing faster than guys can catch up, and then you throw a change-up, you're just helping the batter out. Right now, the biggest thing he's working on is fastball command. Once he gets that, it'll really make his off-speed pitches better." Martinez is relying on his hitting background. "It helps having been a hitter, because I know what hitters are looking for," Martinez said. "If it's a 2-2 count, they may be looking for a curveball or another certain pitch, and I know what I have to throw." According to Cardinals' Minor League pitching coordinator Dyar Miller, the organization has had a lot of success converting position players to pitchers. "If you have a good arm, it's not a tough transition," Miller said. "In our organization, Jason Motte is a conversion guy. We've had a lot of conversion guys. It's not really that hard. "Carlos has a special arm," Miller added. "It's quick. The ball flies out of his hand. He's athletic. He has a good future ahead of him. If he stays healthy and continues on the same path, he's going to be a 1-2-3 guy in the rotation in the Majors. He reminds me of Pedro Martinez. He's the same size and has the same type stuff." Streak buster: Dayton's switch-hitting catcher, Tucker Barnhart, had a 13-game hitting streak come to an end against Beloit on June 2, the second-longest in the Midwest League this season. The 20-year-old Indiana native was 17-for-43 during the span, boosting his batting average from .260 to .310. Sudden impact: Rico Noel joined the Fort Wayne TinCaps from Lake Elsinore of the California League and smacked three homers among his first nine hits. The 2010 fifth-round pick homered once last season between Eugene and Fort Wayne. Despite the power surge, Noel is hitting .186 with the TinCaps, though he has seven walks and has been hit by a pitch five times since joining the team May 14. Dazzling debut: Nineteen-year-old Javier Azcona joined West Michigan on Monday from extended spring training and slugged a three-run homer in the top of the ninth inning to snap a 1-1 tie and give the Whitecaps a 4-1 victory against Peoria in his debut. Azcona, hitless in his first three at-bats, clubbed a full-count, two-out pitch for the homer. Time warp: Scheduled days off don't seem to agree with Wisconsin. The Timber Rattlers have had three scheduled off days this season -- April 24, May 16 and June 6 -- and the Rattlers have been shut out at home after all three days off (Quad Cities, 5-0; Beloit, 7-0; Lake County, 9-0). Curt Rallo is a contributor to MLB.com. This story was not subject to the approval of the National Association of Professional Baseball Leagues or its clubs.